You don’t hear about Cookie Rojas so much anymore, but at the time this 1977 card came out (in what would turn out to be Rojas’ last year in the majors), you could argue for his inclusion in the starting lineup of two franchises’ all-time rosters. He’s kind of like a poor man’s Carlton Fisk that way. For the Philadelphia Phillies, with whom he played throughout the 1960s, his main competition for the second base spot on the all-time squad would have been fellow Cuban Tony Taylor, and though Taylor had a longer tenure with the club and is more often mentioned as a Phillies all-timer than Rojas, when Rojas’ promotion to the majors gave the team a choice between Rojas and Taylor at second base, the Phillies chose Rojas and moved Taylor to third. In Rojas’ first full season at second, in 1965, he made the all-star team, matching Taylor’s one career selection to the midsummer classic. Rojas became an all-star mainstay for his next team, the Kansas City Royals, earning a spot on the team four years in a row from 1971 through 1974. Nonetheless, history began nudging Rojas into the shadows pretty quickly in Kansas City, when the brilliant glovework and, eventually, the surprising power of Rojas’ successor, Frank White, elevated White to a clear choice as the best second baseman the club had ever had. 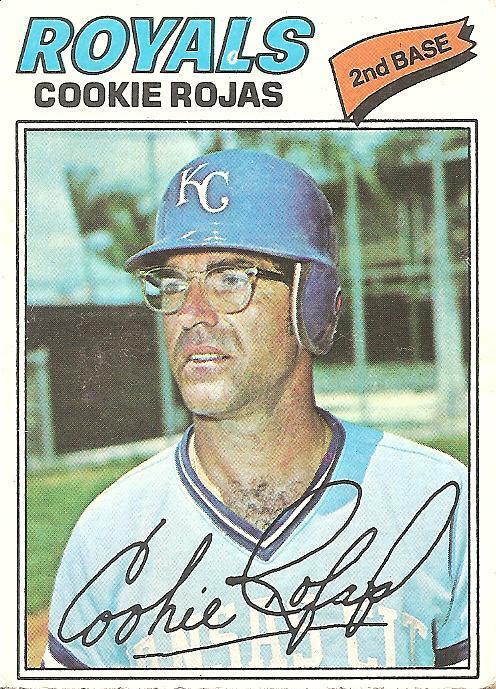 I started avidly collecting cards in 1975, just as Cookie Rojas was beginning what could have been a total fade from history if not for a couple things: his glasses and his name. Out of all the glasses ever worn by any major leaguer ever, the ones seen here really were the nerdiest. You winced for Cookie Rojas. You admired Cookie Rojas. You never forgot Cookie Rojas, the professional baseball player with the glasses of a small-town spinster librarian from 1952. As for his name, it could not have been more appealing to a kid unless perhaps it was Hostess Cupcakes Rojas. The name had much to do with a third reason why I’ll never forget Cookie Rojas. Though you might get the idea, what with all the verbiage about it these past few years, that I was an extremely attentive lover of baseball cards back when I was a kid, in truth I was the same dufus then that I am now, given to gaps of comprehension that were (and are) so glaring as to seem intentional, willful, as if I am someone who prefers being sort of stupid about the world. It kind of added a certain mystery, not knowing everything very well. And this is how I confused, for the entirety of my childhood, Cookie Rojas with Cookie Lavagetto. I read baseball books all the time, so I had come upon the story of Cookie Lavagetto breaking up Bill Bevens’ bid to throw the first no-hitter in World Series history in 1947. I added to my knowledge of that dramatic anecdote my glancing sense, from looking at the back of Cookie Rojas’ card, that Cookie Rojas had been around for a long time, from several years before I had even been born, and once you got several years beyond when I was born you might as well have been around since Moses parted the Red Sea. And so through stupidity and perhaps some sort of need for magic Cookie Rojas became in my mind the longest-tenured player in the majors, by far, an amazing feat considering his fairly modest stats. It was somehow a life-affirming story, this tale of Cookie Roja-getto, who after becoming an unlikely World Series hero in the immediate wake of World War II stuck around decade after decade without ever really being noticed very much, just sticking on the sidelines and enduring in his horn-rimmed glasses. As a fellow marginal type with glasses, I aspired to such a tenacious if barely visible purchase on the world. But I knew it was magical, impossible, so I didn’t look too closely into the matter, knowing that to do so would be to disperse the myth that a relative nobody could last and last. Turns out I wasn’t the only one with Cookie Rojas visitations in my youth. The bespectacled second-sacker comes up in a conversation I had with Will Carroll on Will’s Baseball Prospectus podcast. Thanks to long-time haunter of these posts “spdurph” for his very generous review of Cardboard Gods at his site, Innocents and Accidents, Hints and Allegations. You are currently browsing the archives for the Cookie Rojas category.